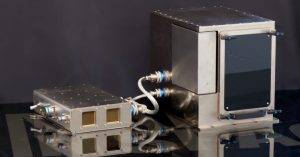 Wondering what’s the first thing 3D printed in space? Don’t worry, it’s not obvious to anyone else, either. It’s a backup faceplate for the 3D printer’s print head — in other words, it attaches to the box that shoots the plastic filament out onto the print surface, keeping all of the various wires and sensitive bits in place. So, no, it’s perhaps not the most exciting thing they could have printed — but holy crap, guys, we’re making things in space now. Alas, this particular print probably won’t be sticking around the ISS for very long. It’s being sent back down to Earth in a few weeks, where it’ll be compared to an identical component printed down here so differences between the two can be gauged. For the curious: the 3D printer being used for this isn’t your run-of-the-mill piece of kit — they didn’t just stick a Makerbot on a rocket and send it on up. The printer in use here is called the Zero-G, and was built specifically for zero gravity operation by NASA and a company that (aptly) calls themselves MadeInSpace. 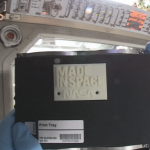 The printer hitched a ride up to the International Space Station on a SpaceX resupply mission back at the end of September.